Julie Rowan-Zoch recently did a stunning review of an Anthony Browne book titled One Gorilla a Counting Book. You should check out this review on her blog. Reading this review reminded the Mom Person that we actually had an Anthony Browne book called Gorilla. So we decided to reread this little gem and share it with you. The Mom Person doesn’t remember when or where she found this book, but it’s a special one for her, having several important things going for it. One – it’s very small. 4″ X 5″. The Mom Person likes small books. Two – it’s about a gorilla. The Mom Person likes gorillas. I don’t know any gorillas so I can’t say if I like them or not, but I like the one in this book. Three – The Mom Person thinks that the illustrations in this book are fantastic. I agree with this. There is a feel of whimsical (I like that word, whimsical!) realism in each picture. And lots of funny little details to look for. And Four – the story is a simple sweet one about having dreams and bringing them to life. Gorilla is about a little girl who LOVES gorillas and wants to go to the zoo to see them. But her father is always too busy to take her. He’s too busy to do anything with her. It’s very sad. (There is no mother in this book. I don’t know why) On her birthday, she receives a toy gorilla and is rather miffed that it is not a real one. But in the night magical things happen that I won’t tell you about. You’ll have to read the book! Gorilla was first published by Alfred A. Knopf in 1983. Our miniature edition was printed in 1991. I would imagine that the book can be found in a bigger size. I highly recommend it! This entry was posted in children's books, friendship, reading dogs and tagged Anthony Browne, gorillas, picture books, reading dogs by readingwithrhythm. Bookmark the permalink. 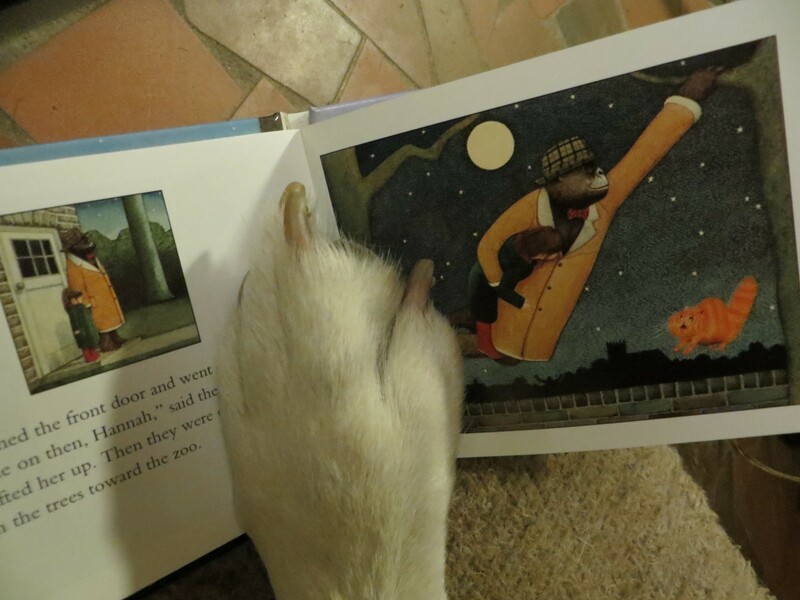 Your paw looks very big and powerful on this book, Rhythm! I like gorillas. I have a toy one that says, “Whoop! Whoop! Whoop!” When you bite his belly. I named him Mr. Bananas. I like bananas, too! hahaha! That’s a pretty funny gorilla you have. And that’s a good name for him! I like bananas too. We take banana chips to school for our treats. I had a great big gorilla when I was a pup that I slept with all the time. But now he just sits around and watches. I do have some big feet, but the book is very small. Thanks for stopping by. I think you would like this book! Amazon has kindly informed me that your book is winging it’s way down under to my shelf as we speak…yipee! Nice book hat, by the way. Oh! Oh! And it’s due to arrive on my birthday!!! Yip-yip-yipee! How serendipitous!! I’ll kind of get to be with you for you birthday celebration! Would it be rude to ask a Gargoyle how old you will be? Are you like ancient old? Or fresh and new? You look like a youngster to me! Happy Day to you! I’m older than my teeth, that much I’m prepared to admit to! Sounds like a fun book! The kids and I love picture books, and this one looks like it ‘takes’ the reader on a neat adventure. We’ll have to look for it during out library trip today! It is a very cute book. I think that your kids will surely like it! Have fun at the library! Thanks for the mention! Yes, I was a bit shocked at the size of the book next to your paw, but I too enjoy a small book now and again! Are you trying to read through osmosis, or learning to balance the good things in life in the last photo? I will be talking to 1st graders this week about picture books, and will be mentioning the importance of looking, as is mentioned in the great video you’ve posted. Thanks! haha! Yeh, Playing with books, it’s kind of like the book eating kid. Mostly it’s the Mom Person always looking for a new silly thing for me to do. I’m glad you got something from that video. I thought it was rather interesting. I hope you have fun with the 1st graders! Just found out yesterday how silly dogs can be too – our neighbor Red jumped up on my car to ‘help’ me brush off all the snow! You ‘kids’ are fun! It is a really fun little story. I think you would like it. 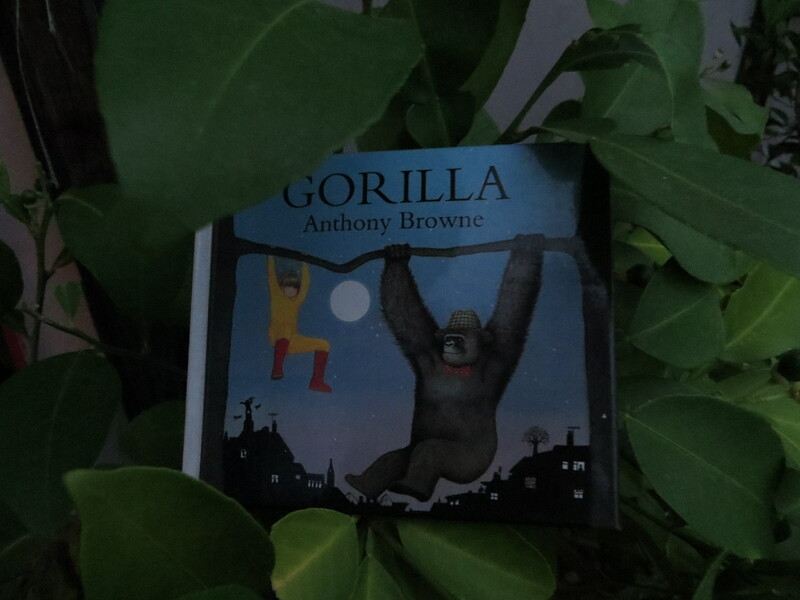 Anthony Browne books are the BEST! Great choice. He really is quite clever! 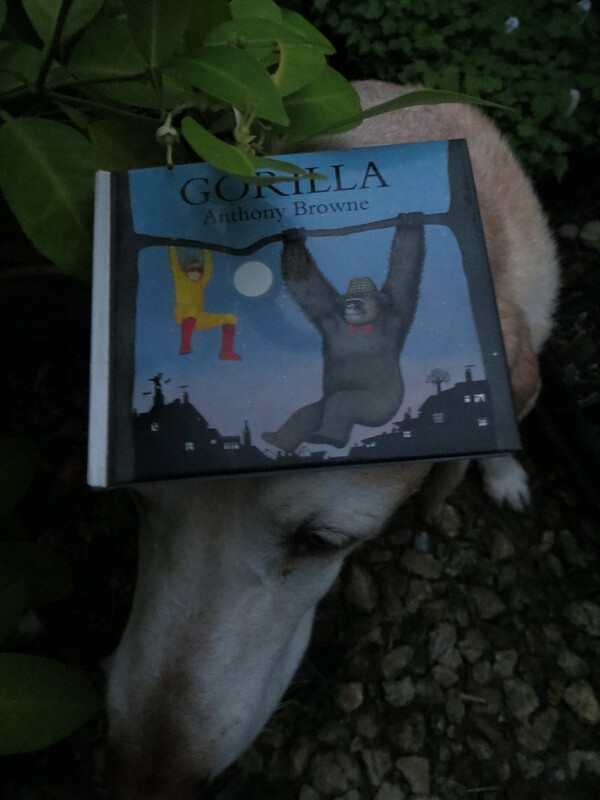 Love the paw:book ratio and I am a big Anthony Browne and gorilla fan… this looks a great book for me, Rhythm! Thanks for posting the video, too! That Mr Browne is pretty incredible! I think you will like this book. And I’m glad you liked the video. sounded like a pretty good conference they had.